In Indian mythology, Agni was considered to be the messenger of the gods, linking the earth to the heavens, conveying all the mortal offerings to the gods. Agni was instrumental in all rituals in the vedic period, with priests performing a Yagna with fire to invoke the blessings of the gods. Agni was considered at once, the devourer and purifier of all things with his seven tongues of flame. Agni was also identified with the sun god Aditya as the giver of life and sustenance. Agni was also considered to be timeless and immortal because fire can always be rekindled and rejuvenated even after it goes out. Just like the story of Prometheus, when fire came to be domesticated for use in cooking, warming or metallurgy, fire acquired a trinity of personalities: that of the domestic fire that serves mankind, that of the forest fire that roams free and that of the heavenly fire that connects mankind with the heavens by carrying their offerings during ceremonies or burning the dead and carrying their souls to heaven. The constellation of the Krithika or the Pleidas was associated with Agni. According to the epic poem ‘Kumarasambhava’, along with the 6 celestial Krithika maidens, Agni was instrumental in the birth of the War God Karthikeya. Agni was also associated with the human physiology and Ayurveda, with the stomach being considered a furnace which consumes nutrients and transmits energy to the rest of the body. The sanskrit root for Agni oddly sounds similar to the latin root for the same word ‘Ignios’, both implying the 3 forms of fire, lightning and the sun, giving it the meaning ‘that which shines forth’. As a result, fire is associated with time, protection, hunger, anger and knowledge. Agni in indian mythology is depicted as a red, two-faced being, with seven hands, three legs and seven fiery tongues to lick the sacrificial butter. He rides a ram or a chariot drawn by fiery horses. 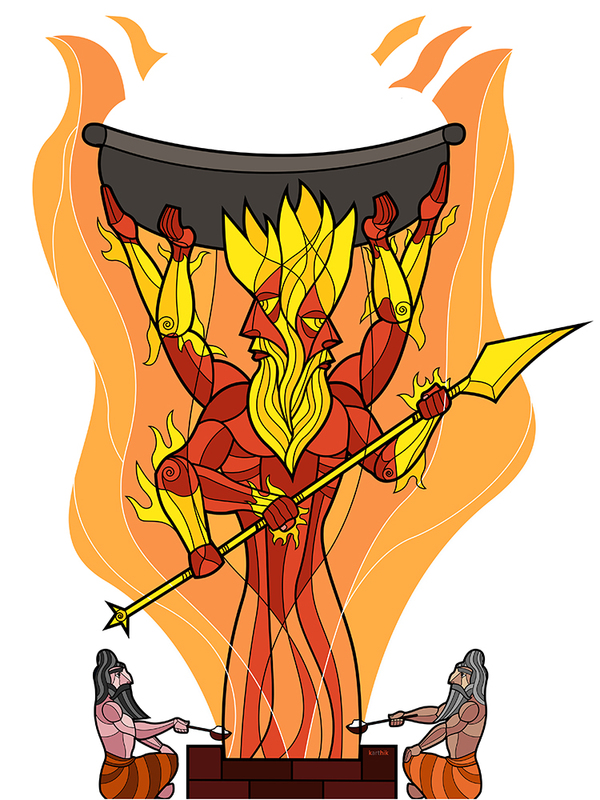 When it came to drawing Agni, I stuck to the simplest aspects of him, with 2 faces and 7 hands, wielding a fiery lance, emerging from the sacrificial fire and carrying the offerings to the heavens.